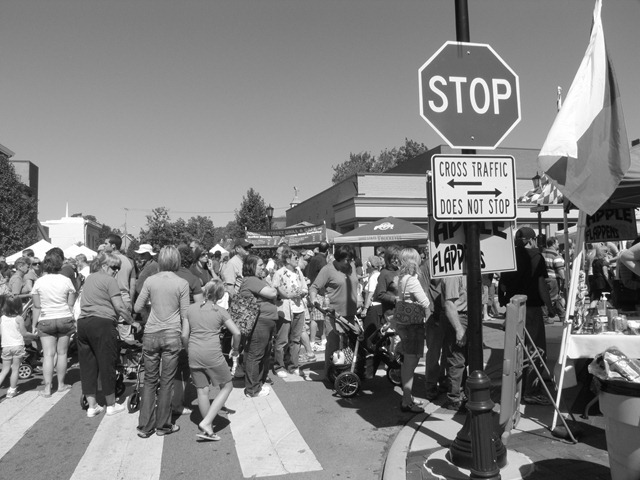 Town officials close roads, main streets and thoroughfares in order that vendors and artists can set up their booths. The crowds converge on the downtown, winding their way through the masses, and being courteous. For one day, the community comes together for a celebration of harvest. It is amazing how such a cheap plastic camera can create artsy images. I guess that is the popularity of the Holga cameras with fine art photographers. Here are two more images from the patio series. Film: Ilford PanF+. Exposure: 20 seconds. I have a series of images created with the Holga 6X12 Pinhole camera, focusing on our patio. One edge of the patio has a small area for flowers. We have planted purple cone flowers, and they are now starting to wilt, making an interesting composition for the Holga. One of the hummingbird feeders perches above the fence attracting several regulars. Film: Ilford PanF+, exposure 20 seconds.